This is an easy and elegant dish, and it's special enough for a Sunday dinner or holiday meal. The potatoes are roasted right along with the pork. It's an excellent alternative to the larger crown roast. For a complete dinner, add some chunks of carrots to roast with the potatoes and pork. Add hot baked rolls, salad, and your favorite steamed vegetables for a perfect family meal. I roasted the pork with fingerling potatoes (pictured), but small, new, or "baby" potatoes may be used. Or quarter medium-sized red potatoes. Or, if you're looking for a simple rib roast recipe, take a look at this roast with honey orange marinade or the pork roast with mustard rub. Wash the roast and pat dry. Rub roast all over with the Cajun seasoning, dry mustard, thyme, 1/2 teaspoon salt, half of the minced garlic, and 1 tablespoon of olive oil. Sear the roast over medium-high heat in a skillet in remaining olive oil for about 3 to 5 minutes on each side, or until nicely browned. Toss potatoes with the remaining minced garlic, onion wedges, and the melted butter. Arrange the potatoes in the baking pan and sprinkle with salt and pepper. Place the browned rib roast on the vegetables, bones facing down. Pour the wine or chicken broth in the pan. Roast, uncovered, for 1 hour and 20 minutes, or until potatoes are tender and the roast registers at least 145 F* when a meat thermometer is in the thickest part of the meat, not touching fat or bone. If the rib ends begin to brown too much, cover each with a piece of foil. 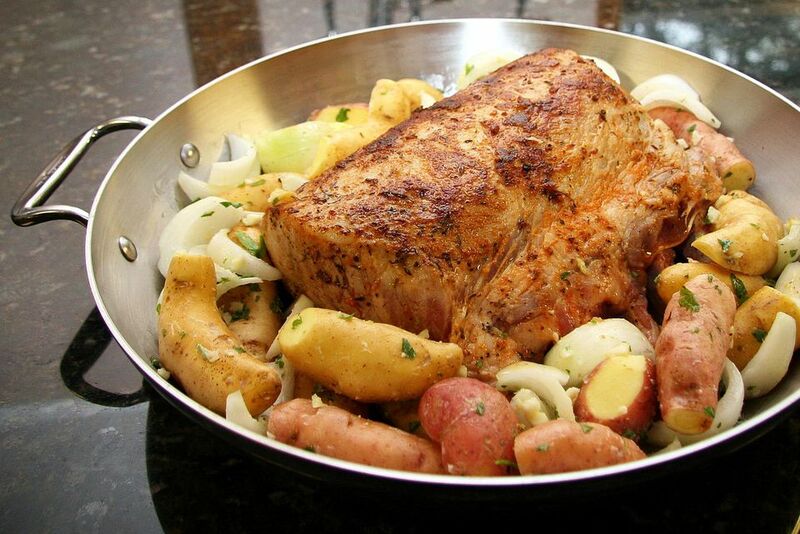 Cut between the ribs into separate chops and serve with the roasted potatoes and onions. *According to the USDA, the minimum safe temperature for pork is 145 F. For ground pork, the minimum safe temperature is 160 F.